To present pertinent quotes from sastra, acaryas and our acarya (Srila A. C. Bhaktivedanta Swami Prabhupada) on the subject of jiva-tattva in a logical way that shows conclusively that the living entities in the spiritual world do not fall from there. We have purposely avoided making statements or including references which are ambiguous, as they distract the reader from the focus of this paper. The necessity for this paper arises due to the continued misunderstanding of the actual siddhanta on jiva-tattva by a section of devotees. Many illogical statements have been made in defense of the theory that we fall from the Lord's eternal lila. We will show by analysis of rasa-tattva and logic that is is completely impossible and illogical for living entities to fall from the spiritual world. Websters New World Dictionary defines "infallible" as: 1- incapable of error, never wrong, 2-not liable to fail, go wrong, make a mistake etc, 3-incapable of error in setting forth doctrine on faith and morals. Statements taken as indicating that the origin of all living entities in this material world is by falling from the Lord's lila are obtained thru misinterpretation of secondary indirect statements and not primary direct statements. According to Sri Chaitanya Mahaprabhu, one must consider direct first hand evidence rather than subsidiary indirect statements interpreted according to one's necessity. To introduce ambiguous statements and interpret them distorts the clear meaning of the primary evidence further. The Our Original Position book (OOP's) clouds the issue by presenting inconclusive arguments without answering the many contradictions pointed out in this presentation. When the living entity thus turns away from the Supreme Lord, he also forgets his own constitutional position as a servant of the Lord. This bewildering, fearful condition is effected by the potency for illusion, called maya. Regarding your second question, have the conditioned souls ever seen Krsna? Were they with the Lord before being conditioned by the desire to lord it over material nature? Yes, the conditioned souls are parts and parcels of the Lord and thus they were with Krsna before being conditioned. Just as the child must have seen his father because the father places the child in the womb of the mother, similarly each soul has seen Krsna or the Supreme Father. But at that time the conditioned souls are resting in the condition called susupti which is exactly like deep sleep without dream, or anesthetized state, therefore they do not remember being with Krsna when they wake up in the material world and become engaged in material affairs. When the living entity forgets his constitutional position as an eternal servant of Krsna. Free choice is an inherent quality of all living entities, yet this quality is greatly misunderstood. As we will show, residents of the spiritual world are blissful and are never forgetful of their eternal position as servitors of the Supreme Lord and therefore will never misuse their free will. All living entities in the spiritual world are on the same transcendental platform. References for this are given later in this presentation. There is no more chance for a jiva to leave the spiritual world than it is possible for Baladeva to give up his relationship with Lord Krsna. Bhaktijana: When the souls that were never conditioned at all..., do they also have the independence? The living entity enmeshed in maya sees no viable choice besides maya, in the sense that he is attached and thinks that this life of maya is in his best interest. Although he has the free choice to choose spiritual life, he sees this as a threat to his sense gratification and therefore undesirable. In the spiritual world however, the living entity, fully absorbed and overwhelmed with ecstatic love, cannot bear the thought of doing anything averse to the Lord's interest—seeing this as a threat to his continued absorption in pure loving ecstatic devotional service—his very life. In the spiritual world, all the living entities are fully self-realized. As shown below in section 6a, they have fully realized the conclusions of sastra—that they are an eternal servant of the Lord, and they are fully experiencing their realizations of eternal blissfulness. It is not that they know every last detail of sastra. For example, some of the gopis were previously the Personified Vedas. Although as gopis, they are celebrated as exhibiting the highest standard of devotion and are recognized as such by Sri Chaitanya Mahaprabhu—ramya kacit upasana vraja-vadhu-vargena, they had almost no knowledge of the Vedas, and state as much in their wonderful prayers upon meeting their beloved Krsna after so long at Kuruksetra. (Bhag. 10.82.48) Yet we should not agree with them that they are ordinary girls simply engaged in household affairs. They are the personification of the Vedas, absorbed in the highest mellows of devotion—krsna-prema. 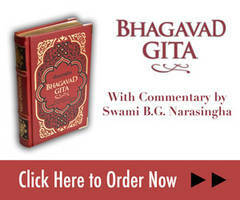 The source of the dispute over the siddhanta regarding the origin of the jiva stems from the fact that vast amounts of devotees are not well read in the Goswami's literatures, have not understood their conclusions properly and thus do not properly know the siddhanta. A lack of proper understanding or appreciation of the most dear associates of the Lord is shown, for instance, by those who try to equate the appearance of the pure devotee Tulasi-devi in this material world as synonomous with that of ordinary conditioned jivas. In fact to think that any associate of the Lord in the spiritual world can fall from His association showns a lack of understanding of the basic intrinsic nature of the Lord's svarupa-sakti and it's wonderful all absorbing ecstatic attribute, Krsna-prema. If we [incorrectly] assume that the siddhanta is that we do fall from the spiritual world, we are faced with a host of contradictions which cannot be resolved. The bulk of this presentation is concerned with documenting these contradictions with quotes from sastra, our acaryas and Srila Prabhupada. The official Iskcon GBC presentation, Our Original Position, fails to prove that the nitya-mukta jivas fall from the spiritual world. Inconclusive statements are given in an attempt to show that the jivas all originated in this material world by falling from the Lords lila in the spiritual world. This OOPs book does not address the real arguments or resolve the innumerable contradictions which arise from their hypothesis. The jivas originate from the tatastha. Innumerable references from prominent acaryas, some of which are given below, clearly and repeatedly state that the marginal jivas originate from the tatastha-sakti of the Lord and not in the spiritual (cit-sakti) realm itself. The previous reference is also quoted in OOP's on page 269 but rather than accept this straightforward statement for what it is, it is lamely suggested that we shouldn't try to understand such things. One may then intelligently ask, "Then why have you written the OOPs book at all?!" The following reference is very clear and straightforward, presented exactly as translated and published in English by leading devotee scholars under the direction of Srila Bhaktisiddhanta Saraswati Thakura. Unexplainable contradictions inherent in the "Fall Theory:"
There are no sastric statements that we fall from the spiritual world nor are there any references anywhere to a "mukta-baddha " living entity--that is, a nitya-mukta living entity that has fallen from the spiritual world and become nitya-baddha. Bhaktivinode Thakura in his Jaiva Dharma lists three types of living entities and gives specific information of their creation by the Lord. That is, the nitya-mukta parsada's of Vaikuntha are generated by Sankarsana, the nitya-mukta parsada's of Goloka Vrndavana are generated by Balarama and the marginal jivas of the tatastha-sakti are generated from Maha Vishnu. He does not mention a fourth type of entity, nor does any other authoritative source anywhere mention such an entity. -- The only statements, both in sastra and by Vaishnava acaryas are that the residents of the spiritual world are infallible and are eternally resident there--forever free from the influence of maya. Innumerable commentaries by prominent Gaudiya Vaishnava acaryas clearly indicate that we do not fall from the spiritual world. Srila Prabhupada also states that "the conclusion is that no one falls." (Bhag. 3.16.26, purp.) These clearly stated "no fall" statements cannot even begin to be reconciled by the "fall theory" advocates. This one point in itself renders the "fall theory" inconclusive and erroneous. There is no sastra sangati--reconciliation of contradictory statements of sastra or acaryas. To present a non-sastric and incomplete explanation that the residents of Vaikuntha have not actually fallen but are only daydreaming about mahamaya is not at all consistent with the numerous quotes presented herein--the residents of Vaikuntha never forget Krsna, never are influenced by maha-maya, are eternally blissful etc. If they experience any dreams they would certainly be about Krsna. We have heard the siddhanta that no one falls from the spiritual world personally from many many highly exaulted Gaudiya Vaisnava acaryas, in addition to our own Guru Maharaja, Srila A. C. Bhaktivedanta Swami Prabhupada [the conclusion is that no one falls from the spiritual world: Bhag. 3.16.26 purp], such as Srila Sridhara Maharaja, recognized by Srila Bhaktisiddhanta Sarasvati Thakura as sastra-nipuna (scriptural genious), Srila Bhakti Promod Puri Maharaja, chief editor of the daily spiritual newspaper Nadiya Prakasa during and after the time of Srila Bhaktisiddhanta, Srila Bhakti Vallabh Tirtha Maharaja, the successor acarya of Shri Chaitanya Gaudiya Matha of Madhava Maharaja, Srila Bhaktivedanta Narayana Maharaja, a leading disciple of Bhakti Prajnana Kesava Maharaja, the sannyasa guru of Srila Prabhupada, and leading sannyasi disciples of Srila Prabhupada such as Jagat Guru Swami B. G. Narasingha and Swami B. V. Tripurari and many others. And they are repeating what they learned from their Guru Maharaja, Srila Bhaktisiddhanta Sarasvati Thakura and his direct disciples. Although Srila Prabhupada mentions having differences with his godbrothers and the Gaudiya Matha he never once even suggests that they do not understand the siddhanta. It is highly unlikely that they would say something different from that which was taught to them by their Guru Maharaja. These aforementioned Vaisnavas are seniormost in terms of their realizations and spiritual standing, so their knowledge and realization should not be completely disregarded. Additionally, our godbrother, the late Gour Govinda Maharaja, was highly learned in siddhanta and scrutinizingly studied the commentaries of our acaryas, especially Srila Bhaktisiddhanta Sarasvati Thakura. He was known for his uncompromizing firm stand with the "No Fall" siddhanta. 5a- References showing that the residents of the spiritual world are extremely happy and being very much in love with Krsna, could never consider leaving. Srila Baladeva Vidyabhusana writes in Govinda-bhasya, "One cannot even imagine that the Supreme Lord Hari would ever desire that the liberated souls fall down, nor would the liberated souls ever desire to leave the Lord." He further states that this is because of their extreme mutual love and cites four verses as evidence (Bg. 7.17, Bhag. 9.4.68, 9.4.65 and 2.8.6). 5b- The Yoga-maya energy of the spiritual world always acts to perfect the Lords lila. 5c- Envy does not manifest in the spiritual world. There is no envy in the spiritual world. The OOP's book states that when a resident there becomes envious he must leave because envy is not allowed. We do not agree that envy can manifest even for a fraction of a second. If you wish to light a match in a gas filled room and think that you may go outside after lighting the match you will blow yourself up first, you cannot have the fire in the room for a moment. Similarly envy cannot even manifest in the spiritual realm--the nature of the spiritual world is such that the unpleasant conditions under which envy and other negative material qualities may develop are completely absent there, as we have shown with the many references quoted herein. 6b- The residents are completely fixed in knowledge of their constitutional position. The following quotes prove that every resident of the spiritual world is fully cognizant in their sat-cit-ananda spiritual body and cannot become illusioned; additionally, illusion being a product of maya, is not allowed there–na yatra maya (Bhag. 2.9.10). They have free choice but but being in full knowledge and infallible they choose to use it properly and never wish to imitate the Lord. We contrast these descriptions of self-realization and full knowledge regarding the residents of the spiritual worlds with that presented in the GBC Position Booklet. Therein, "full of knowledge" is defined as "possessing only a small portion of knowledge according to ones small capacity and necessity." It is also stated that, "the living entity, covered by envy, cannot recognize that he will suffer in the material world...Covered by lust, the living entity forgets his original knowledge and enters into the material domain to try to satisfy his desires." Here in particular, three gross mistakes are made. The first mistake is the assumption that "full knowledge," in reference to the residents of the spiritual world, can be interpreted to mean that these residents are not fully self realized as shown above and therefore they make the mistake of choosing to go to the material world. The second mistake is that the living entity may be covered by envy and lust while still within the spiritual world. The third mistake is that a resident of the spiritual world has desires to satisfy. These points have already been discussed and validated in this essay. 6e- References that pure devotees (such as the residents of the spiritual world) have no personal desires (for sense gratification). Desireless means... to be conscious of one's actual position and thus desire satisfaction only [of] the Supreme Lord. Srila Jiva Gosvami has explained this desirelessness as bhajaniya-parama-purusa-sukha-matra-sva-sukhatvam in his Sandarbha. This means that one should feel happy only by experiencing the happiness of the Supreme Lord. ... the spirit of akamah [desirelessness] is fully exhibited in the spiritual world. (Bhag. 2.3.10, purport). Rupa Goswami has given us the definition of pure devotional service as being anyabhilasita-sunyam, or without desires other than service to please Krsna. Jiva Goswami comments that the word used here is anyabhilasita which means "the habit of acting under extraneous desires which are semi-natural with the person involved." So uttama-bhakti means not only "absence of extraneous desires," but also the complete absence of the very nature from which such extraneous desires arise. Bhaktivinode Thakura corroborates this in his booklet "Bhakti-tattva-viveka " in his analysis of bhakti-abasa. Therein he states that in the [nitya-mukta ] liberated state "the jiva remains free from any material designation and hence within him there is no opportunity for the marginal characteristics of bhakti to exist." Additionally, Visvanatha Cakravartipada in his Sri Bhakti-rasamrta-sindhu-bindu has defined the svarupa-laksana (intrinsic characteristic) of uttama-bhakti [as possessed by the residents of the spiritual world] as involving activities favorable to Sri Krsna [anukulyena krsnanusilanam ] and the tatastha-laksana (extrinsic characteristic) of uttama-bhakti is described in the first line of the same verse, anyabhilasita-sunyam: uttama bhakti is devoid of all desires other than to please Sri Krsna. 7- All examples of apparent falldowns of nitya-parsadas from the eternal lila of the Lord cited by proponents of the "fall theory" are not actual falldowns. Tulasi is not an ordinary living entity. It is mentioned many times in sastra and in Srila Prabhupada's purports (pertinent quotes included within this presentation) that the descent of the Lord's nitya-parsadas is for the purpose of His lila and is not in the same category as the appearance of the nitya-baddha living entities. Nor is the descent of Tulasi an example of a resident of the spiritual world becoming envious of Krsna. It is a pastime under the influence of yogamaya not maha-maya. The example of Kala Krsnadasa is inappropriate since he was already in the material world. He is not mentioned in Gaura-Gannodesa-dipika as being Krsna parsada. Furthermore, Sri Caitanya Mahaprabhu did not allow him to fall away but protected him and kept him with Him for a year. Kala Krsnadasa was then given the shelter of Nityananda Prabhu and the nectarean service of informing Mother Saci and the residents of Navadvipa of the Lords South Indian tour in great detail. Other so-called examples of falldown from spiritual positions, that have been cited, are in each case a special arrangement by the Lord—spiritually situated devotees were simply taking part in the Lord's transcendental lila. Citraketu did not fall into material life. It is clear from his prayers to the Lord (as Vrtrasura) that he was still very much an exalted devotee, that his bhakti was not covered, and commentators have explained that this [apparent falldown] was a special favor of the Lord for it increased his attachment to the Lord. Srila Prabhupada explains very clearly that Jaya and Vijaya's fall was a special arrangement of the Lord for His lila (Bhag. 3.16.26-27, purp.). Jiva Gosvami writes in Priti-sandarbha, 7, that when Jaya and Vijaya became demons, within they knew themselves and kept their spiritual form. The fall of Bharata Maharaja was also special as he was protected by the Lord. Even in the body of a deer and later as an apparently incoherent Jada Bharat he remembered his past experiences and Krsna consciousness and perfected himself in the next life. Even if they fall, they become more attached to You, just as when King Citraketu, Bharata Maharaja and King Indradyumna had a so-called fall down. In their fallen forms, such as Vrtrasura [previously King Citraketu], their love multiplied hundreds of times. Therefore, the fall of a devotee causes his love to increase. In history there are many instances of devotees like Citraketu, Indradyumna and Maharaja Bharata who circumstantially fell down but were still protected. Maharaja Bharata, for example, because of his attachment to a deer, thought of the deer at the time of death, and therefore in his next life he became a deer (yam yam vapi smaran bhavam tyajaty ante kalevaram ). Because of protection by the Supreme Personality of Godhead, however, the deer remembered his relationship with the Lord and next took birth in a good brahminical family and performed devotional service (sucinam srimatam gehe yoga-bhrasto 'bhijayate ). Similarly, Citraketu fell down and became a demon, Vrtrasura, but he too was protected. Srila Prabhupada states, "It is a most ludicrous argument to say that the Supreme Lord is overpowered by His own material energy." (Bhag. 3.7.9, purp.) This is the conception of the impersonalists who think that a portion of the Lord's svarupa sakti, the Lord's most powerful sakti, can be covered by maya—that maya can cover brahman. Actually, the fall theory is worse than Mayavada for it suggests that not only brahman but Parabrahman may be covered by maya. It is stated in Bhag. 2.5.13 that maya never appears in front of the Lord, therefore it is apparent that those who are situated on the front side of the Lord, the pure devotees, are never effected by maya. Are we to suggest that the Lord's internal potency is fallible and imperfect? Many references attest to the invincibility of the Lord's internal potency. That the superior energy of the Lord (svarupa-sakti ) can be overwhelmed by the inferior energy of the Lord (maya-sakti ) is not supported anywhere by sastra or by any acaryas. Yet, even disregarding the direct statement of the Srimad-Bhagavatam 2.9.10, that maya cannot enter the spiritual world, this theory [that all jivas in the material world come by falldown from the spiritual world] requires that the eternal associates of Krsna be influenced by maya while in the spiritual world, in order for them to become illusioned. For "the living entity cannot be forgetful of his real identity unless influenced by the avidya potency." (Bhag. 3.7.5, purp.) Certainly it is considered an imperfection of the spiritual world that one firmly situated under the personal protection of the divine internal potency of the Lord and ecstatically engaged in the Lord's loving transcendental service in "the highest perfectional stage of living conditions," (Bhag. 2.9.10, purport), can fall from that to repeated hellish and degraded lives of birth and death. Are we to accept that uncountable formerly self-realized living entities, billions is just an acre of countryside, all became envious and fell from the bliss of the Lord's personal association? Perhaps Vaikuntha should then be named Sakuntha, the abode of anxiety. A sastric reference to the anartha called tattva-vibrahma is given by Bhaktivinode Thakura in his Bhajana-rahasya, wherein it is stated that one remains in illusion about different tattva's, such as jiva-tattva, guru-tattva, vaisnava-tattva, and rasa-tattva due to one's offenses etc. Visvanatha Cakravarti Thakura in his Madhurya Kadambini quotes a verse from Bhakti-rasamrta-sindhu regarding the offenses which lead to a material conception of spiritual topics. The effect of one's offenses is that one developes the same qualities which they criticize of another. We feel strongly that the misunderstanding of this subject belies a fundamental lack of comprehension of the essential substance of Krsna consciousness. The only subject not covered in this paper, which is however available in our longer Web presentation, is the topic of "Preaching is not always siddhanta:"
Paramahamsa: So we can come to the spiritual world and return?